While shopping in Vile Parle one sunny afternoon, we stumbled upon a mall in the midst of the market and walked in. Little did we expect to find anything out of the ordinary, but boy were we pleasantly surprised! 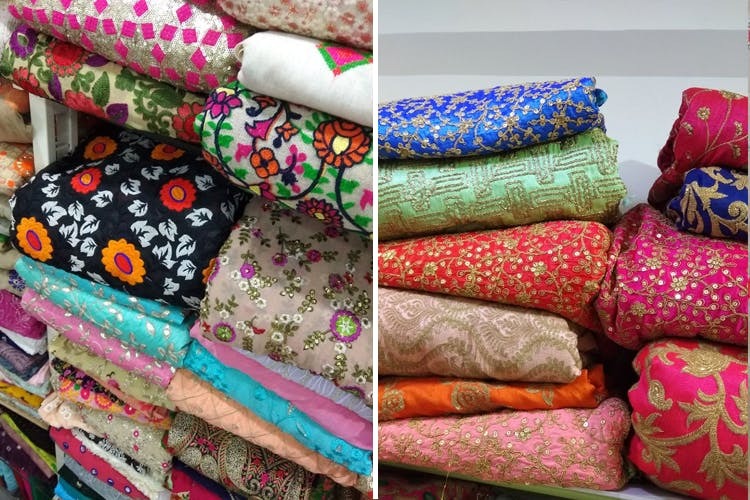 The Fabric Store, situated in the heart of that mall,has a great collection of quirky linen fabrics, georgette, cotton, sequinned fabric, embroidered fabric and even fabric for men, for waistcoats, jackets, shirts and kurta material. The Fabric Store has a vast collection of fabrics, from affordable to even high end. We’ve already recommended it to a few friends who’re looking for wedding fabric material. They also have a great collection of ready-made kurtas, jackets for women and waistcoats for men. If you’re looking to do up your home interiors, their fabric range has something for everybody, and will be great for DIY pillow cases, lampshades, even table cloths. They even stitch the garment of your choice – kurtas for INR 650, short kurtis for INR 550 and waistcoats for men for INR 850. We fell in love with some lehenga material and are getting one stitched for INR 3,500. If there's a particular style and fabric that you're after, show it to them and they will help you pick the right one you want. We had a fantastic time exploring the store and found some gems. We know we’ve got our next wedding outfit ready, what about you?